The places chosen by Collette were great. The timing was hectic. The service was good, though not as great as other Collette tours. Several things not in the itinerary were added and made the days longer and the trip a bit tiring. We were told the night before on the return in the coach what would happen the next day. A short written information sheet would have helped. Other than that, the tour was excellent. Our guide was kind enough to help when my grown grandson had a problem with a sinus infection. The driver was great with those curvy roads. Favorable memorable experiences included the information given by the local guide in Rome who explained what we were seeing in depth and helped us find the perfect spot wherever we needed to be. Along the Amalfi Coast, the beauty of every place was almost enough to take my breath away. The guide at the Buffalo cheese factory was excellent, and the guide at the Isle of Capri was very good. This was the first European trip for my sister and I and it was perfect! This was the first European trip for my sister and I and it was perfect! 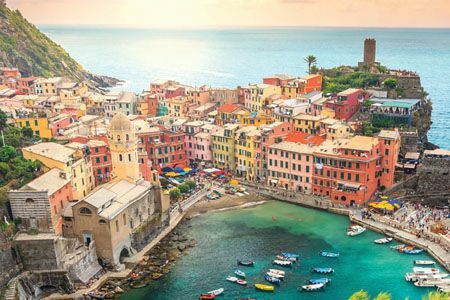 Collette took care of every detail and our tour manager, Jovanka, made it her mission to ensure our trip through Italy was everything we imagined and more. Our coach driver was amazing as well! Neither of them let the bad weather stop them from providing us with a wonderful experience. We didn't have to worry about anything. I would definitely tour with Collette again and hope I can. I would also recommend them to anyone who wants a tour where every detail is taken care of and all you have to do is enjoy, relax and have a wonderful time! Collette is difficult to contact if unable to ring the UK 0800 number. The Rome and Amalfi Coast holiday was eventful but the Amalfi Coast hotel was below the standard expected. Loved the history especially the Vatican. Already planning my next trip with Collette! This was my 3rd trip with Collette. I've never been disappointed with their tours. Any problems that may have come up were out of their control! Excellent, and they delivered what they said in the brochure. This was my 2nd trip on this particular tour. It added some new stops, and I wanted to revisit Pompeii & Capri. Everything from the outstanding tour managers to the smallest detail are of the upmost quality. The days spent on the Amalfi Coast were truly memorable. The small towns, the food, the people all added to a fantastic time. Denise, our tour manager, was very proactive and made sure that all was going well during the tour. The tour was fast paced and visited many attractions in a short period of time. The bus driver, Pasquale, was outstanding and should be recognized. The restaurants we visited were all good to excellent. I would have liked to spend more time in Pompeii as that was rushed due to so many cruise ships in port and so many people. So busy, The most memorable experience was visiting the Vatican Museum and the Sistine Chapel with the history and background provided by our tour guide Federico. He was excellent as a tour guide. Tour director, Mattia, made all the difference in this incredible trip. This was my first Collette tour and will not be my last. Excellent hotels, fabulous food except dinners at Graal Hotel and great unusual tours, i.e., winery with lunch, buffalo mozzarella factory and dinner with opera show. On the downside, the tour group was too large and the last night hotel in Rome, A Roma Lifestyle Hotel, although was beautiful and the buffet dinner was amazing, it was in the middle of nowhere. The first hotel in Rome, the Imperiale, would have been a better choice for the last night's stay. A half day in Positano or Ischia instead of a full day in Capri would have been nice. Capri was much too crowded to enjoy. Ravello is a beautiful area. Too bad we had no free afternoons to enjoy it. Our free evenings there were too short. Peppe, our bus driver, was phenomenal on the very winding Amalfi coast! Great car service from home to airport and return. See previous page Add- more time in Naples. Every day there was a memorable experience! Sheep/goats on the Amalfi road which halted traffic in both directions..Ballroom dancing in Rovello square in the early evening and, of course, my favorite, the buffalo mozzarella factory/farm. I would definitely recommend Collette, and already have! The tour was really great, we have avoided tours in the past but really enjoyed this. The guide was extremely good and so was the bus driver. Our hotel was wonderful but a long trip after every excursion. I liked all the side trips we took but would have enjoyed a little bit more shopping free time. Yes, I will recommend them but they need to improve the quality of hiring and/or training of the Tour guides. The one assigned to this particular Tour lacked in several areas thus making this particular tour nor a very enjoyable one. Several issues with accomodations and Tour guide was extremely rude. I have done several tours with Coletter and this is the first time I need to complaint about the Tour Guide who reflect very poorly and unfairly on Colette. Most likely he is new and no properly trained but he lacked the right type of personality to deal with large groups. 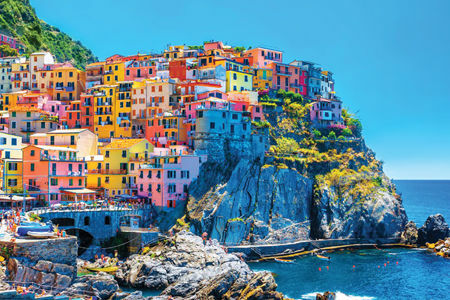 Thank you for speaking with us and writing in regarding your Rome & Amalfi Coast tour. A member of the Guest Relations Team will be reaching out to you. If you like spending hours on long bus trips because your hotel is not centrally located and if you enjoy elbowing your way through mobs of tourists then Collette is just the ticket. One of the draws of Collette's promotions was the promise of free time to explore on your own. Most of this "free time" involved segments of an hour or so starting in the middle of tourist traps with no time or information to get to places of real interest. That said, there were excursions that appealed to a majority of our group. While I was being jostled by other tourists, some of my travel companions were enjoying themselves shopping. So maybe Collette's problem is really my problem. But for me, this was one of the worst vacations I've been on. One final note. Collette's flight arrangements were awful. We had to change planes going and coming home. The latter was unavoidable. But in neither instance were we given enough time to make connections. We did so going to Rome only through the efforts of an official at the airport in Paris who allowed us to bypass the lines. Going home we had to run to make connections in Amsterdam and got to the plane only because they held the plane for us. And while we made the plane, our luggage didn't. My favorite memorable experiences were the two times I did not go on the planned excursions and went off on my own. Thank you for traveling with Collette to Rome and the Amalfi Coast. A member of the Guest Relations Team will be reaching out to discuss your feedback. The trip was great and the tour director and bus driver were excellent. Mattia offered many informative highlights of Italy but also provided an insight into the way of life in Italy. Pepe’s driving ability along the very narrow and winding roads of the Amalfi coast amazing. The tour was excellent but the days were long with long drives each day. A little more free time would be helpful. This was a wonderful tour that included so many treasures of Italy. HOWEVER, it is advertised as "moderate" walking. We walked 3-5 miles every day! I am handicapped and was in a great deal of pain at the end of each day. The write up for this Amalfi Coast trip should read "challenging". The tour covered everything and was well organized. The hotels were great. Our bus driver was a marvel on the winding mountain roads. I think Pompei was the highlight of the tour. I can only say from start to finish- an excellent experiance. Group was too large (43), tipping policy abhorrent, nickel-and-dime stuff (charging for water). Thank you for traveling with Collette to Rome and the Amalfi Coast. A member of the Guest Relations Team will follow up with you. Both the tour guide(luciana) and Pasquale (bus driver) made our trip very pleasureable. She really knows her stuff and makes it very easy to listen when she explained different things. Would love to do the trip again with the two of them !!!!!!!. Luciana was an excellent tour manager. Our most memorable visit was to the Winery on the slopes of Mount Vesuvius. Every aspect of the trip was well planned and accounted for. The tour guide, Lee Greene, was a well-informed, extremely pleasant, very caring and the basis of a wonderful journey. The tour was rigorous, but, all encompassing. The history, art, geography, and culture of Rome and The Amalfi Coast were all well covered in a limited amount of time. 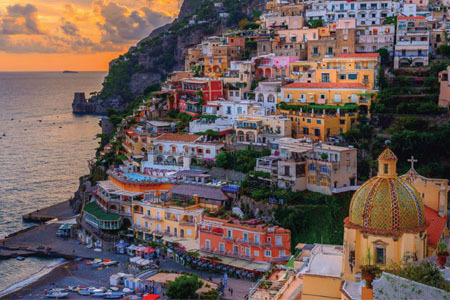 An action packed holiday with breathtaking scenery along the Amalfi coast. The tour was well put together, there were a good range of visits every day. My favourite was the visit to Monticasino monastery. Service was top notch. No complaints. Any issue with tour were addressed quickly. Well organized tour. Something for everyone. Luciana was most knowledgeable and a very entertaining guide. Magnificent buildings and ancient ruins. Georgous scenery. Delicious meals. What more could one want? Excellent value. Choices made during the tour allow for flexibility and personal interest . My favorite experiences were the visit to Pompeii and the Vatican. Both were mind blowing! Excellent, very well planned and executed. Highlights were vatican, coloseum, pompei, and amalfi coast. Only negative was it was on a holiday weekend whtch made the crowds and traffic a problem. My daughter and I were very pleased with our tour.I will travel with them again. We had a very enjoyable trip.We hope to travel with Collett again. Responsive and professional service. Handled the few problems very fast and fair. Deeply knowledgeable in many areas of Italian culture and history. Personable and fun too. From beginning to end a dream tour. The Limo pickup was flawless, coming and returning. The meeting at the Rome Airport went well. All the hotels were excellent and the tour guide was fantastic. Each of the tours were inspiring and uneventful. Early warnings of the need for walking and stair climbing allowed us to be forewarned and forearmed. We knew that this wasn't a vacation for lounging around. It was a TOUR of some real exceptional places and Collette came thru again. As usual Rome was fantastic with us visiting the Trevi Fountain, the Spanish Steps, the Pantheon and the Colosseum. That was capped off by dinner out with new friends on the tour. Pompeii and the Temples in Paestum were exceptional as well as the museum in Naples. Needless to say the views up and down the Amalfi coast were thrilling, including the our trip to the Isle of Capri. All in all I would highly recommend this tour. Get a guide who actually wants to be a guide and is physically able to conduct walking tours. Book hotels with reliable wifi, with access to the beach when they are on the water, with enough transportation(shuttles, taxis) for tour members so that tour members can easily get to restaurants, the beach, the local town when on nontour time. Book guides who will actually take tour people to the local sites of interest, not just to shopping and eating hubs. To go to Capri and hear nothing of the Blue Grotto or the castello at the top is unforgivable. Insist that hotels give the level of service they claim. Have never had more horrible food - in Italy! You have to really screw up to get such consistently horrible food in Italy. Fedora in Rome was a great local guide, but the tours should not have been crammed all into one day. That put us both at the Coliseum and at the Vatican and St. Peters at the height of the day with seas of other tours - literally you could do nothing but be moved like cattle by the crowd. Not enjoyable at all and allowed for no time to really enjoy the sites - was like a walking drive-by. 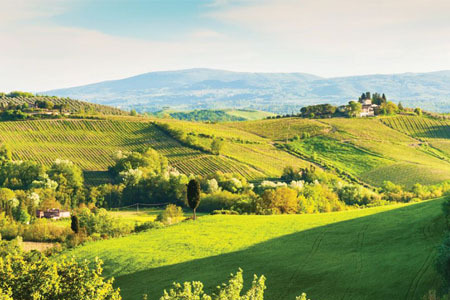 Professional and well organized Italy Package Tour with Collette! Great tour Manager, *personal details removed by Feefo* and fine drivers *personal details removed by Feefo* & *personal details removed by Feefo*. Hotels in Rome and Amalfi offered good service too. My only disappointment was the initial room we were given in Raitio...not only was there no view of the water-it felt like we were in an oversized water closet! However, I spoke with *personal details removed by Feefo*, and the local hotel manager *personal details removed by Feefo*and with an additional charge he provided us with a great room! The hotel in Rome was fine. Well organized, fully packed trip. Local guides were great. Some days a little too jam packed, could use some downtime. Liked the unexpected, I.e., bufala farm, Montecassino, etc. Good group of people starting with Tour Guide and driver. Should share list of travelers at kick off event in addition your name tags. See previous comments, especially liked the local guides and side trips to farm, vineyard and monestary. The amalfi coast and Isole di capri and all resetaurants /food was great. I liked the visit to the limoncello factory. I liked the visit to the Benedictine monastery of montecassino. I enjoyed always sitting in the small local restaurants, local food and the walk in the street and buying things from side walk which were cheap and good to give for friends and family.Most of all I liked the limoncello and wine from ITALY, the Alitalia charged me 93 Dollars for transporting it,I just found that in my American express Bill . I will enquire about it. It was an exquisite experience! Look forward to my next Collette tour. Great tour, well planned. *Personal Details removed by Feefo* our tour manager, served us well. Even shared his wonderful singing voice during our bus traveling. Visiting the Vatican. Wonderful food. Wonderful trip, super guide and great arrangements!!! Great mix of people!! The recent trip we took with Collette to the Rome and the Amalfi Coast was wonderful. Everything was well planned and done with taste. Our guide was wonderful, the accommodations were nice, and the bus driver was super. The hotel arrangements were well placed for all of our expeditions. Everything was pre-arranged at all of the places we visited and we enjoyed all aspects of the trip. We had a great group and a super trip. We will use Collette again. They took care of our extra adventure, and we were very pleased with our experience. My husband and I enjoyed eating at all of the family owned restaurants. These small restaurants give you the true flavor of Italian cooking. We also enjoyed visiting the historical sites in Rome, Pompeii, and Paestum. All the small towns along the coast are so beautiful. It is just breath-taking. The trip will always be a wonderful memory. Our tour director was fabulous! I loved the hotel right on the Mediterranean! It was a beautiful area, and very educational! Very good hotels and dining experiences! The Hotel Cetus...The wonderful help at the hotel and great food! Awful. We were very disappointed in the lack of time at each destination. We would have liked to have seen LESS and enjoy MORE! Also, we did not care for the tour guide. She spoke to us like we were school children. Thanks for bringing this to our attention. We have forwarded over your feedback to members of our product and tour manager team so they can improve the tour for future guests. Had excellent tour manager *personal info removed by Feefo* In general was pretty good trip. The tour exceeded our expectations. The tour guide, ************ was knowledgeable and a pleasure to travel with. It was a great tour. The excursions were a great balance of history and interesting places. The only negative was the location of the hotel in Amalfi Coast. It was at the top of the mountain in Ravello. The view was fabulous, but it took 45 minutes to get up and down the mountain each way, which was very time consuming. We weren't at the hotel during daylight much to enjoy the view. Excellent tour guide and great driver. Pace was perfect. Met many new friends. It was a better tour than the Collette tour we took 2 years ago that went to England, Ireland, Scotland, and Whales. 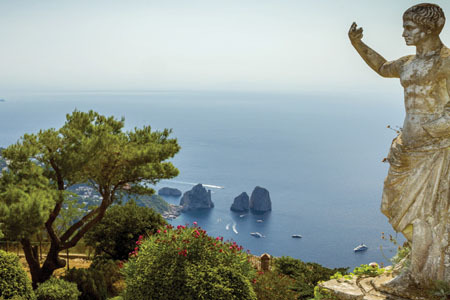 Rome, Pompeii, the Buffalo farm, the beauty of the Amalfi Coast, the vineyard experience, the delicious food. The trip was good except for the accommodations at Hotel Graal. While the location was Suberb the room was not a high standard. I would have liked a little more luxury. This place was bare bones. The food however was good and the service was adequate. While staying at one hotel for 5 nights was nice the location in Ravello required us to spend up to 2 hours in transit twice a day. Loved the ruins of Pompei and the buffalo mozzarella farm. A Great Tour with New Friends! The tour was well-planned (if a little busy) and enjoyed by everyone who was in attendance. Our bus driver, "Beppe" was wonderful! He negotiated all of the roads in southern Italy nicely and allowed us to "stay on the bus" at stops if we needed to! Loved the places we toured. Paestum was a wonderful. Pompeii incredible! Our hotel in Cetara, the Cetus was awesome! Just wish we could have spent a little more time on our balcony overlooking the Mediterranean Sea! Loved the touring group we were traveling with; made new friends! My favorite memorable experience was the opera dinner theater in Rome. I loved the music, the venue, and the food. First time taking a tour and had several questions. The staff did an excellent job explaining the details of the tour. The tour manager (Paula) did a fantastic job. The driver (Antonio) guided us safely through or journey. Great place in the universe, shown by entertaining guide, with new friends. Outstanding spots. Very well directed by our guide. Cultural and historical pluses during the whole trip. Bucket list historic sites. Some excellent meals. Photo-tastic locations. More activities than could be handled, but that helped us slow down and relax on some days. Starting with a great ride to the airport to a wonderful tour guide, my trip to Italy was fantastic. Staying in two hotels was wonderful as I could really get a feel for the area and for the culture! Planning my next trip already. My most memorable experience was exploring Ravello! What a charming and interesting town! This was our second Collette tour (we did Costa Rica in December 2015), and once again, they knocked the ball out of the park! The biggest highlight of our Costa Rica trip was the Tour Director, and likewise for this trip, Rome and Amalfi. We were blessed to have Mirjam de Rejt as our Tour Director. She kept us moving, kept us safe, and gave us many good laughs along the way. Her professionalism was outstanding. She was incredibly accommodating and helpful. We flew in a day early, which I would highly recommend. Even with the extra day, we found the first few days of the tour a bit overly ambitious, which is my only "knock" about this trip. The itinerary was jam packed, and if you add the optional tours, I'll guarantee you will be pooped. We opted to skip one day of the tour (the benefit of being based in one location for 5 days), and were well refreshed and ready to go for the balance of the tour. The Amalfi segment based us in Ravello, an absolutely charming town. From what I can tell, other tour dates use different Amalfi bases. Our driver was extremely careful and drove excellently. Our group was 33, and everyone was pleasant and congenial, and we made several friends whom we've already been in touch with. The hotels were fine, and the food was terrific. If I were to do this again, I would go a bit later in September, the summer crowds were still in full force. Great trip! Amalfi coast was just beautiful . The little town of Revello was my favorite, also Sorrento . 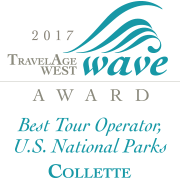 We are extremely happy to be using Collette Tours to travel. Whenever we have questions the representatives have been most pleasant and helpful. We love the sedan service! No hassle getting to the airport or getting out when we return from a trip. We thoroughly enjoyed our trip to Rome and the Amalfi Coast. Being part of a tour has been wonderful as we meet new people while exploring a new country. The choice of hotels has always been to our satisfaction. Who wouldn't want to walk out on to a veranda/patio overlooking the beautiful Mediterranean every day?! The pace of the tour was good. This being our third tour with Collette, we really enjoy the free time to explore the small towns and eat in the smaller pubs and cafés. Perfect opportunity to take plenty of photos, too! Our tour manager, Tracy Allyne, was OUTSTANDING! She is a wealth of knowledge and shared that knowledge with so much enthusiasm! She was so pleasant and genuine. From the moment we met her to the minute she put us in the car for our trip to the airport she was wonderful. My husband was not feeling well one evening and we did not attend the planned dinner. She immediately came to see us. She had tea and bread sent to our room. We knew we had a gem!! She knew every one of the travelers by name. She even managed to teach us a little Italian! She and our driver, Antonio, worked extremely well as a team. We would highly recommend this tour and would hope that the group would be lucky enough to get The Dynamic Duo of Tracy and Antonio!! Second tour was as good as the first! Well organized an efficient use of time. The hotels are well chosen for value of service and location. Tour Managers are knowledgeable, patient and professional while offering great customer service. 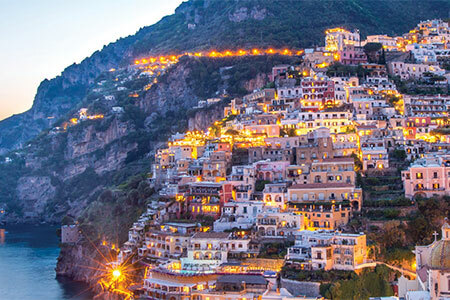 The visit to the Amalfi and excursions offered made this a trip of a lifetime. Delayed notice of change of hotel in Rome concerning noting "previous hotel unable to accommodate .." ?? we booked our tour back in Oct. 2015. Lots of time to accommodate before being notified just a few wks before departure!! Booking appeared to have been arranged too late. The re-assigned Hotel Mediterranean room was very disappointing - not clean, carpet filthy (turned my socks black), room decor old & un-inviting, too far from downtown/venues though noted as "walkable distances" .. NOT! Nicest part was the main foyer. We had a major break in communication with our Tour Manager 1st day Re: correct meeting place instructions. Firstly, she did not give us directions first hand, we learned them from another guest which confused the issue. We spent 3 hrs. in St. Pete's Square & made 3 phone calls to her trying to get/find right directions but she still could not communicate them correctly. Turned out there were 2 other sites in the square with a similar name "Sevilla" as meeting places. We started questioning as soon as we arrived to check site 3 HRS. BEFORE MEETING TIME. I placed 1st call to Tour Manager - from this first call her instructions had us to meet at "Savilla Cafe", one we had located, other tour groups were meeting at both sites. We remained there in St. Pete's square all that time waiting & looking, no Collete tour group! At one point my husband & I separated with him at one "Sevilla Galleria" site, I at this "Sevilla Cafe" site. Turned out the meeting place was a 3rd location "Sevilla Restaurant" apparently outside square (never did locate it & nobody we asked knew it either). On a second call I left voice message to call back. The call back came as a final, last chance warning, instrs. again given were unclear, could not find her. A 3rd panic call from me turned into a last desperate attempt for help to find her location. It was under direct/constant threat bus was going to leave us there, a BLATANT REFUSAL TO COME FIND US in the square that she finally gave us a different, much clearer marker (the fountains) that easily located her without any further problem. She made us feel like COMPLETE IDIOTS! We were left so embarrassed we felt we had to apologize to rest of guests on bus who told us later they were only waiting ~5 mins. Certainly not a great way to start off tour for sure! I was so upset it took few days for me to even speak to Tour Manager again ... she never once, either then or any time during the tour apologized for her actions or responsibility here. We respectfully understand & appreciate the importance of scheduling & event timing, however, it was very clear to us, had she (neglectfully) left us in St. Pete's square that day our plan was to get a taxi back to hotel, call Colette & arrange for immediate removal from tour .... she did not give appropriate instructions, could not communicate effectively on multiple attempts & when everything was failing would not even try to locate us on site ---- UNACCEPTABLE behaviour from a Tour Manager. Our friends & family (some have travelled with Colette in past) are shocked by our experience when they hear about it, as were we. She was quick though to accept our tip envelope at end of tour (see further comments on that issue below). Another issue was the level of expectation & recommendations given to us for tipping on the introductory information sheet. Colette is a more expensive tour than many we researched. As salaried employees I find it UNBELIEVABLE that specific recommendations of 66 - 176 EU/couple be considered for both the driver & the Tour Manager for 10 day tour .. that is more money than I made as a health care provider, saving lives!! Discussions with other guests identified same opinion but most paid within those rates so not to be embarrassed .. we paid within lower rates but did so out of guilt. Reflectively it was ridiculous, esp. given our 1st day Tour Manager issue (see above note). NO RECOMMENDATION FOR "SOLICITING" EXTRA MONIES SHOULD BE MADE BY ANY COMPANY OR IT'S PARTICIPANT(S) OTHER THAN STATING "TIPPING APPRECIATED AT GUEST'S DISCRETION", not "tipping is expected in Italy ... All other tips are on you ..." & then given your list!!!!! Added extra financial burden & stress to our trip. Tour was very compressed but ok. More time in Sorrento would have been nice. Last day was long. Maybe add another day in-between as rest day to enjoy The Graal facility & Ravello more. Otherwise - overall tour content was great, the Tour guides were all excellent & informative. Other hotels were clean & welcoming. Bus drivers - all great, unreal how they maneuver those hills, traffic & narrow streets. Provided meals were all superb. Yes, I would recommend company (with some discussion) & likely would book again. The Collette tour to Rome and the Amalfi Coast was very nice. However, I thought that there were too many excursions that should have been included in the trip instead of having to pay extra. Also, most of the dinners included were mediocre at best. The tour size was very good - not too many people. I would not categorize this as a deluxe tour - maybe a 3 star. I will say that the guides that met us at local sites were very good. I think that considering the price of the tour compared to what was actually included was rather expensive. Also, I think that the tipping expected at the end of the tour was unreasonable. The tour guide, Sabine, was wonderful and local tour guides for each excursion were excellent as well as knowledgeable. The bus driver was skillful, courteous, and cheerful even on the narrow and curvy roads of the Amalfi coast. One complaint was that with only a week prior to departure Collette announced a change of hotel for our Rome overnights. This was a problem because we had already booked pre-nights at the hotel we were original told we would be staying. I feel that Collette should have the rooms already booked and secured before they send out their itineraries. The tour was flexible enough to meet everyone's needs. We took advantage of every optional excursion possible but never felt overwhelmed. We still had many opportunities to explore on our own or take some quiet time away from the group. Our favorite experiences were touring Pompei with knowledgable guides and also wandering the local area of Ravello and Scala. We found a charming local restaurant, Borgo San Pietro that I highly recommend. Our guide was excellent and really made the tour. The hotels were not good. Not well maintained. Our shower flooded the floor due to the missing gasket on the bottom of the door. Plus old uncomfortable mattresses. 2nd Collette tour, this was the best ever! Our tour was wonderful and our tour guide was exceptional. He was so knowledgeable, very kind and caring and went out of his way to see that our days were full of exciting adventures. An elderly lady in our group became ill and he stayed with her in the hospital till she was released the next morning. He had very knowledgeable guides at certain sites who were fantastic. The accommodations in Amalfia were exceptional, Rome was ok but last night in Rome was awful. The airport and Delta employees were awful on return trip. But the most memorable was the Coliseum, Paestum, and Pompeii. Our group of people were the best. Sweet, thoughtful and we all looked after each other. Some of the most unique sightseeing can mean accessing locations that restrict motor coaches, especially in historic areas. For your comfort, we recommend bringing walking shoes. If you require a walker or wheelchair, or have difficulty walking, you may not be able to access some of these areas and may want to consider an alternate programme with us. Our travel counselors can provide additional information or assistance to help you determine the perfect trip for you. *When the Vatican option falls on a Wednesday, the order of inclusions may be reversed in order to participate in all activities for that day. ** During your stay on the Amalfi Coast: standard accommodation at the Raito Hotel are limited and available on a first come, first served basis for departures utilising that hotel. Upgrades to superior rooms with sea view are available at an additional cost. Please enquire at time of booking. For departures utilising the Graal Hotel, please note that whilst this hotel offers amazing coastal views, your daily driving times will increase by approximately 45 – 60 minutes each way.